For those of you who know what INotifyPropertyChanged is and also know what kind of a maintenance burden the OnPropertyChanged(“Property”) calls are I would like to share my favorite implementation of the ObservableObject. This is my favorite single slide from the emerging languages conference. I think this sums up the struggle developers of today regularly encounter quite nicely. This image comes from Jonathan Edwards’ Coherence/Subtext talk slides. He went on to then propose some very interesting ideas on how to solve this problem by managing pointers and memory in a new scheme. I’m not able to really comment on his recommendations because I didn’t fully understand them. But what I would like to propose is that there actually might be another way to solve this same problem. 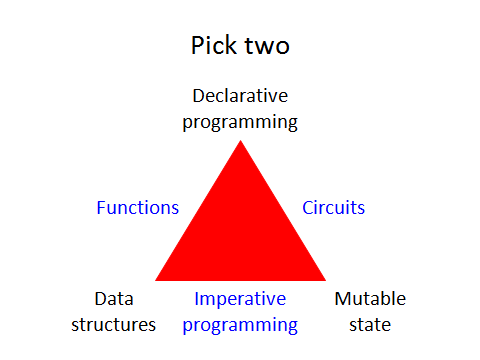 I believe that Pattern Calculus (or Pattern Matching) is a unification of these three problems. It’s a superset of lambda calculus and data structures. 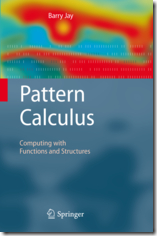 The pattern calculus is the result of a profound re-examination of a 50-year development. but also typing, which itself is also realized following the idea of pattern matching. Code itself can be thought of as data when viewed from inside a compiler. A compiler can transform that data into something executable. This process can be repeated any number of times. Alessandro Warth of OMeta contributes to this idea in his phd dissertation. finally, a (naive) code generator pattern-matches on ASTs to produce code. And I agree with these guys. I have been working on a MetaSharp for a while now and on some of my more ponderous days I have seen to the bottom of the rabbit hole and come to the conclusion that they are right. I’m able to see a world where an application is entirely based upon pattern matching principles. Starting with a core of Patterns you can represent and transform to and from any design pattern imaginable including those needed to create traditional compilers. Essentially this gives you the ability to author an entire application as essentially tiers of patterns and projections. I would like to contribute to the area of Pattern Matching by talking about the promise of scalability. In traditional general purpose programming as your application grows larger it becomes more and more difficult to maintain it. The sheer volume of code becomes infeasible to make broad changes with refactoring tools, the application becomes harder and harder to grasp in its entirety. Also, design patterns implied in the code become harder to enforce as developers begin to encounter new areas for the first time. There are many challenges that arise as an application grows. Roman Ivantsov gave an interesting talk on ERP software and the scalability challenges it faces at the 2008 Lang.Net Symposium. Basically ERP programs are humongous applications, they are complex, costly and risky. What I took away from Roman’s talk, however, is that the solution to the problem is that we need a new approach to address applications of this scale. We cannot develop these applications purely as general purpose languages and succeed. And again, I believe him. I think he is correct. As applications get bigger they can actually take so long to develop that they are obsolete before they are actually done. This is a problem. Maintenance cost in Volume, for traditional applications. 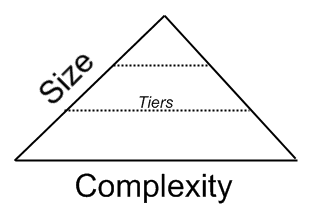 Which is to say as your application becomes larger and you add more and more tiers the complexity also grows. The cost is like a pyramid. There are many things that go into Maintainability but in a general sense it might be said that maintainability is a function of code size and complexity. Pattern matching offers an alternative to this traditional conundrum. 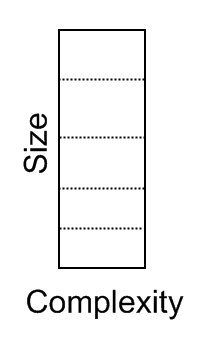 It’s maintainability illustration is more columnar. Maintenance cost in Volume, for pattern matching based applications. Which is to say, that at each tier of an application the complexity could be about the same as the previous tier, thus increasing the functionality of an application for the same volume (cost) of maintainability. Interestingly enough, for small applications or applications with only a single tier the cost is probably higher. But as you grow you begin to reap benefits. This is a hypothesis of mine currently, it has yet to be proven however. Also, given the state of Pattern Matching as it exists today the above promises are definitively false. However I don’t think it needs to be this way. I think it is possible to change solve this problem and usher in a new era of software development paradigms. I have extended UnitDriven to provide support for (the current beta release of) Windows Phone 7. 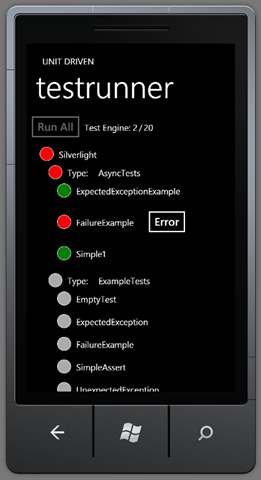 This means you can write a unit test that runs on .NET, Silverlight and Windows Phone. This is an Alpha release for now, hopefully if we get a few people to use it I can make a more stable release when the final version of the WindowsPhone7 SDK is released. Here is a screenshot of UnitDriven running tests on the WindowsPhone7 emulator. One interesting thing is that all I had to do to support this was link files from the Silverlight version of UnitDriven into a new Phone project. It all compiled and ran on the first try. However, even though it ran it wasn’t actually usable. I had to create new versions of the Views to accomodate the smaller screen size and default layout differences (buttons are relatively bigger for example). Also the scroll bars are only visible while scrolling and you have to click and drag on a Circle or the text to actually do the scrolling. Please feel free to comment on the UnitDriven forums if you have any comments or questions!